As we got closer to Chengdu, I got more and more excited. Over the past few days, we had talked about what to do in this city and the prospect of what lay ahead of us made me want to get there as quickly as possible. Pandas, the Chinese Opera, how could I not be excited about this city? Chengdu did not disappoint. But see for yourself why you should visit the Sichuan capital. The Chengdu Research Base of Giant Panda Breeding is your best chance to see pandas in China. Humans have brought pandas almost to extinction and it doesn’t help that the pandas seem to do their best to finish themselves off. They only mate once a year, if they get more than one baby, they reject the second one and the new-borns are so tiny and premature, they barely stand a chance of survival. ‘Jelly worms’, a friend called the babies and she was right. After seeing the tiny panda babies, I am surprised by how they can survive at all. We did not only see baby pandas here in Chengdu, although those were, without doubt, the highlight. 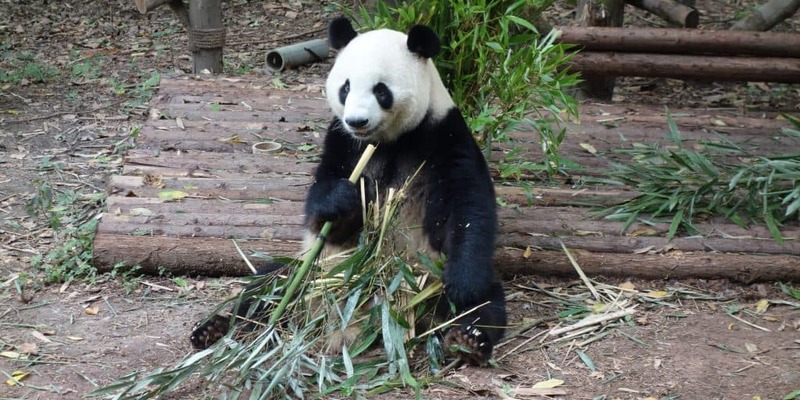 Walking past the enclosures, we saw pandas eating bamboo, pandas climbing trees, pandas sleeping and pandas rolling around – one more fluffy than the other. Be prepared for many moments of cuteness that make you want to adopt one of these animals. Plan your visit to come here early in the morning. Pandas have an aversion to high temperatures (and high for them means above 24°C), so if you get here too late, they will have withdrawn into their air-conditioned houses. 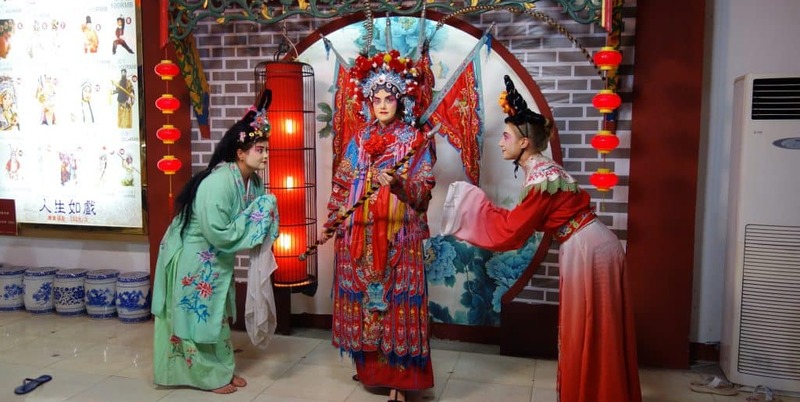 The Chinese Opera was, without doubt, our second highlight in Chengdu. We went to the Shu Feng Ya Yun Opera House. The artists performed a whole range of shows, from singing and dancing to puppet play, shadow play (my favourite) and the famous face-changing, in which the actors change their mask or even their outfit within the fraction of a second. The part I loved most, though, was when we got to dress up as Chinese Opera characters after the performance. They put on a lot of make up, pulled back my hair and the skin of my face and then dressed me in a giant costume that came with a set of flags attached to my back. At the back of the dressing room, they had a stage and two more backgrounds for posing. We had so much fun that night, messing around with different poses. Afterwards, we had to give our costumes back but we kept the make up for a walk around the Night Market. 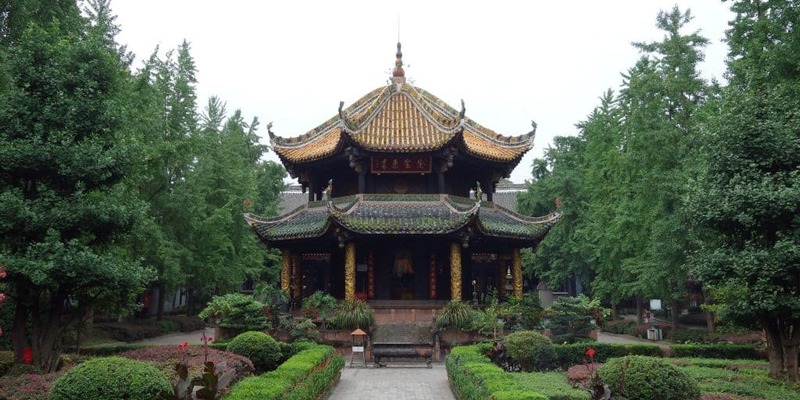 Before Chengdu, we had been to a lot of Buddhist temples but not to a single Taoist temple so I was excited about visiting this one. I still don’t completely understand the concept of the Taoist religion, but the temple was awesome to look at. It didn’t seem to be large from the outside, but when we got inside, it turned out to be huge. There was just one building after another, going on and on. We spent a large amount of time on the grounds, exploring the buildings and watching people pray. Eating hot pot was one of my favourite dining experiences in China. The dish originated in Sichuan, so what better place could there be to try it than in Chengdu? The hot pot restaurant will provide you with a giant pot filled with hot broth. It has an outside part that is usually filled with spicy broth, and a non-spicy broth in the middle (we asked for it to be switched around because the spicy part is mouth-burning spicy). You then order meat, vegetables, tofu and noodles to cook in the hot pot. Leave it in there for a while and then start fishing for it with your chopsticks. The best part is the dipping sauce that you can prepare yourself from different ingredients and that you can then dip your food in. I loved Chengdu’s night market. Maybe I enjoyed it so much because we still had our Chinese Opera make up on and it was fun to go out looking weird, but I think it’s a great place to go for a walk in the evening and have a drink. Many of the old buildings are beautifully lit up. The food is expensive, so you might want to have dinner elsewhere, but you could come for a stroll afterwards and then end up in one of the bars.